PRESS RELEASE: TODD PHELPS CALLS FOR A PLAN TO SAVE ICONIC BUSINESSES. The time is now to ‘Save the Soul’ of Austin. Todd Phelps, candidate for Mayor of Austin, proposes the creation of a board to protect the iconic businesses of Austin. The goal of the “Austin Iconic Businesses Protection and Designation Board” would be to identify the historic and uniquely Austin businesses to provide rent relief through property tax relief for the landowners on where the iconic businesses are located. In the last few years, many of Austin’s longtime favorite businesses have closed due to rising property taxes and steep rents. Some of the most famous Austin eateries to close because of this affordability crisis are: Carmelo’s, Ruby’s BBQ. Dolce Vita, Frank & Angie’s, The Steeping Room in the Domain, Flying Saucer in the Triangle, Sweetish Hill, Hill’s Café, The Frisco, and the most recent announcement from Threadgill’s that is will be closing its doors on Riverside Drive. Phelps noted that the City’s most recent incentive package to a Californian billionaire for a sports stadium as one of the many Adler-era disappointments. He feels that instead of bribing out-of-town companies with subsidies and incentives, we should focus on preserving our iconic businesses and growing our local businesses. 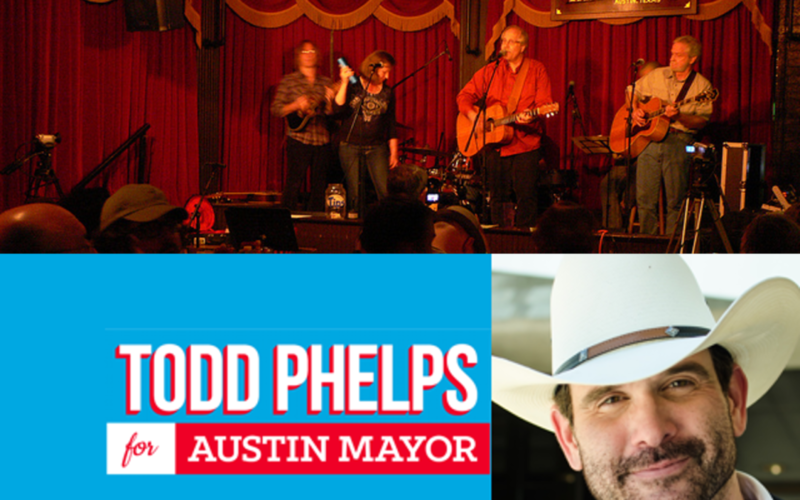 The Todd Phelps For Austin Campaign will be hosting a public campaign party at one of Todd’s favorite Iconic music venues Donn’s Depot this Friday Oct. 5th from 6 to 9 PM. The event will feature live music by Deuce Coupe. Todd Phelps will be on hand listening to the public’s concerns about Austin’s challenges. Donn’s Depot is located at 1600 West 5th St. Austin TX. Donn’s Depot is a 21 and up music venue.